When it comes to reliable material handling equipment, Harlo is known throughout the industry for product innovation and quality manufacturing. A family-owned and operated company that’s been in business since 1937, Harlo is dedicated to building forklifts that deliver optimal performance and are capable of standing up to the most rugged applications and environments. When you’re searching for a new or used Harlo lift in the Chicago area or wherever your business is located, Chicago Industrial offers the value, service and selection you need. For the most rigorous jobs and heaviest workloads, a Harlo rough terrain forklift is your best choice. 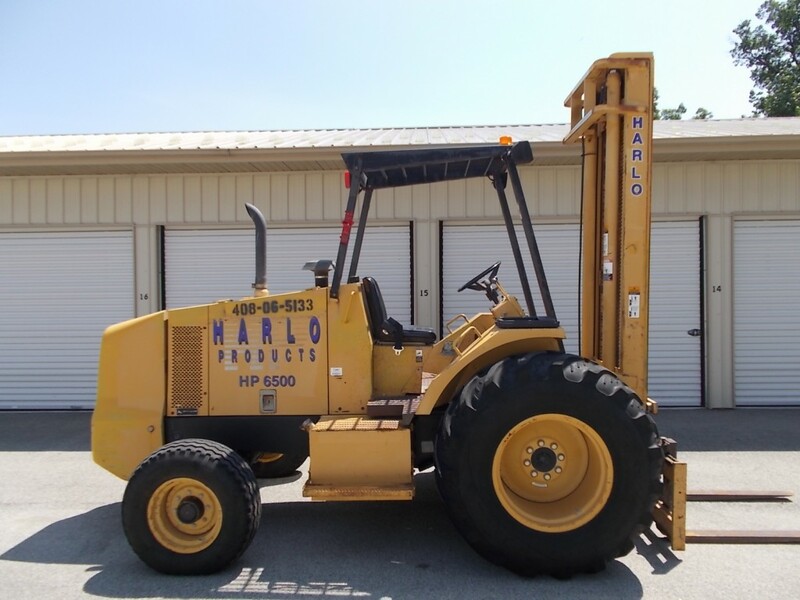 With three distinctive models available — the HP5000, HP6500 and HP8500 — you’re sure to find a Harlo lift for sale that fits your specific needs. Models range in lift capacity from 5,000 pounds to 8,500 pounds, come standard with John Deere 4.5L electric fuel-injection engines and are available with a variety of two-stage and three-stage mast options. Rough terrain Harlo forklifts offer durability in the most challenging work environments. Our selection of new and used Harlo lifts can raise loads extremely high, while still being able to navigate safely through narrow aisles and tight spaces. From faster turnaround times to safer job sites, there are many compelling reasons to invest in quality material handling equipment. We strive to offer a variety of purchasing options to meet the diverse needs of companies in the material handling industry. In addition to carrying the complete line of new Harlo forklifts for sale, we also provide an extensive pre-owned inventory. You’ll find used Harlo lifts in excellent operating condition — our expert technicians carefully recondition the units we sell. We also offer economically priced “as is” used Harlo forklifts that were previously leased. Browse our online inventory and get in touch with us for more information and product availability. If you’re planning on financing a new or used forklift, Chicago Industrial has you covered. We partner with a leading nationwide lender, Direct Capital, to deliver a wide range of financing solutions to help your business achieve its goals. When it comes to shipping, we’re able to accommodate the needs of businesses across the nation and around the world. Simply choose the new or used Harlo lift equipment you’re interested in and get in touch with us for a free competitive quote. We strive to be the one-stop shop for all of your material handling equipment needs. With a massive selection of new and used Harlo lifts for sale, in addition to hundreds of other makes and models, we’ll help you find exactly what you’re looking for and get it to you fast. Give our friendly and knowledgeable representatives a call at 815-744-8811 for addition information and assistance.